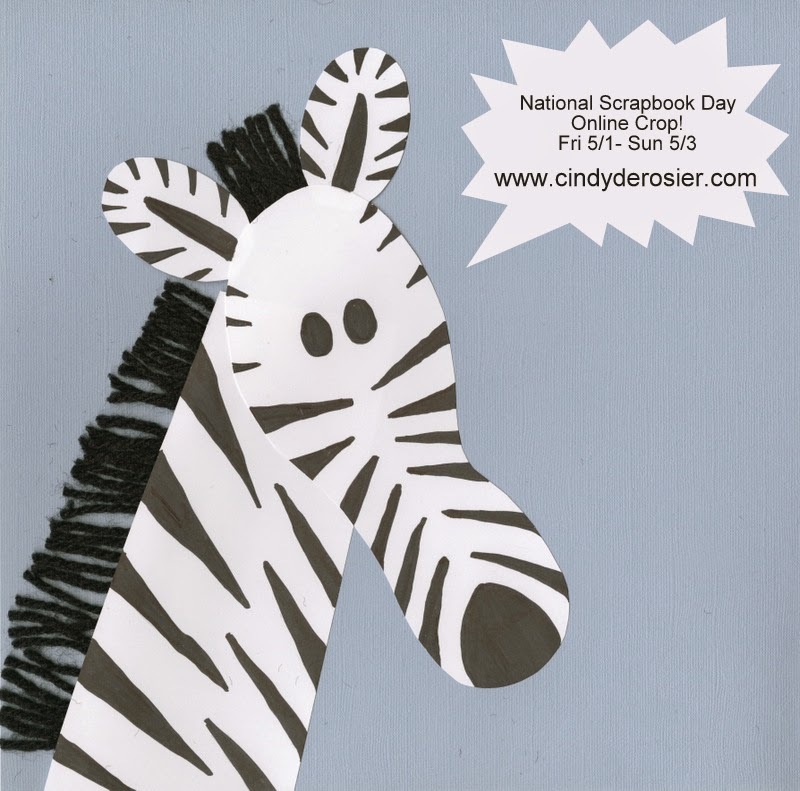 My National Scrapbook Day Online Crop starts tomorrow! The challenges go live at 5:00 am PDT. I have a lot to do to prepare, so that's it for today. I'll be back tomorrow with all the details! Clean the scraproom, removing everything from the floor and main work table. Return all supplies to their proper places. Remove anything from the scraproom that doesn't belong there. Print photos from at least 20 different events/occasions. In order to successfully do 10 challenges, I have to be prepared with a variety of photos, since not every photo works with every challenge. Stock up on the basics. I double-check my supply of adhesives, white and black cardstock, and trimmer blades. Clear the calendar. Steve and Trevor always make plans to be elsewhere, which I greatly appreciate. I work ahead at my jobs and chores so that I'm not stuck doing laundry, running errands, paying bills or doing other weekend tasks when I want to focus on scrapping. Read through any pre-posted challenge information and take note of necessary supplies. Since I'm running my own crop this year, I don't need to check on rules and suggested supply lists, but that's something I have always done when I'm not the hostess. Clear off my computer desk and scanner. I need to be able to quickly scan and upload layouts on NSD without having to move piles of work-related stuff out of the way first. Start brainstorming what stories I might want to tell. Since my list of challenge components includes "Now and Then," I know that's going to be part of a challenge. I don't know what other components it will be paired with, but I'm already thinking about possible directions I can go once the randomizer tells me exactly what the challenges will be. Contact my friends to see how everyone will be celebrating and who will be online and up for chatting! I always try to check in with as many scrappy friends as possible on our holiday. How do you prepare for National Scrapbook Day? 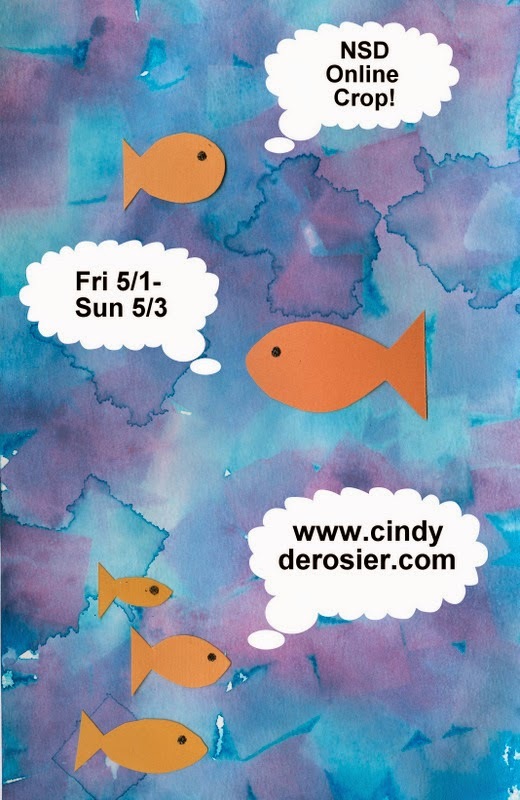 I hope all of you can join me this weekend for a fun and fabulous National Scrapbook Day Online Crop! Details are here. I'm making great progress with my 43 New to Me album, as it's only been about 7 weeks and I'm already on page 10. 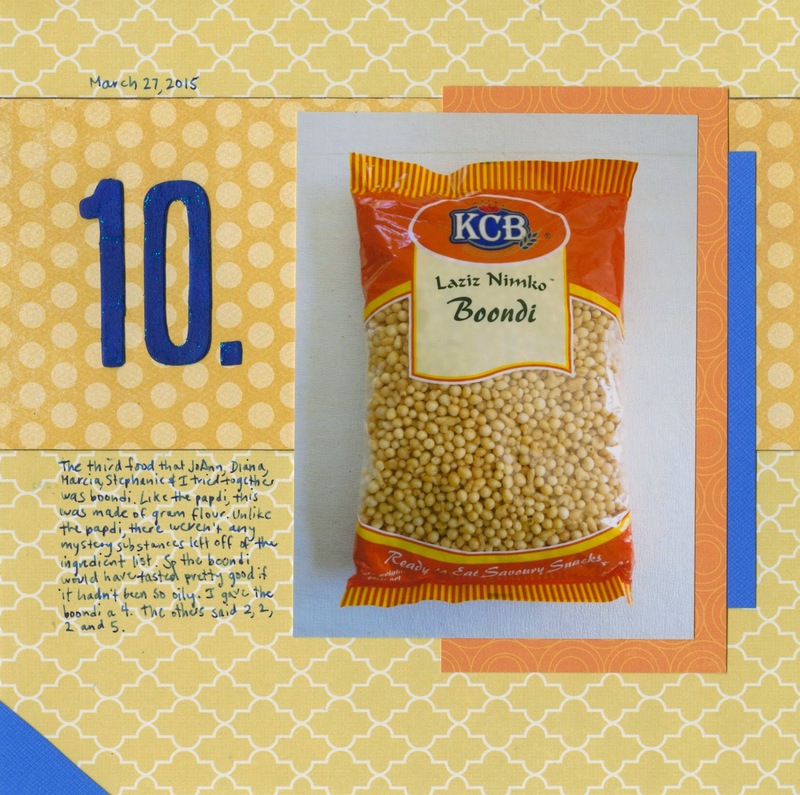 New-to-me food #10 was boondi. I found this package at a local Indian market. Like the papdi, this product is made of gram flour. 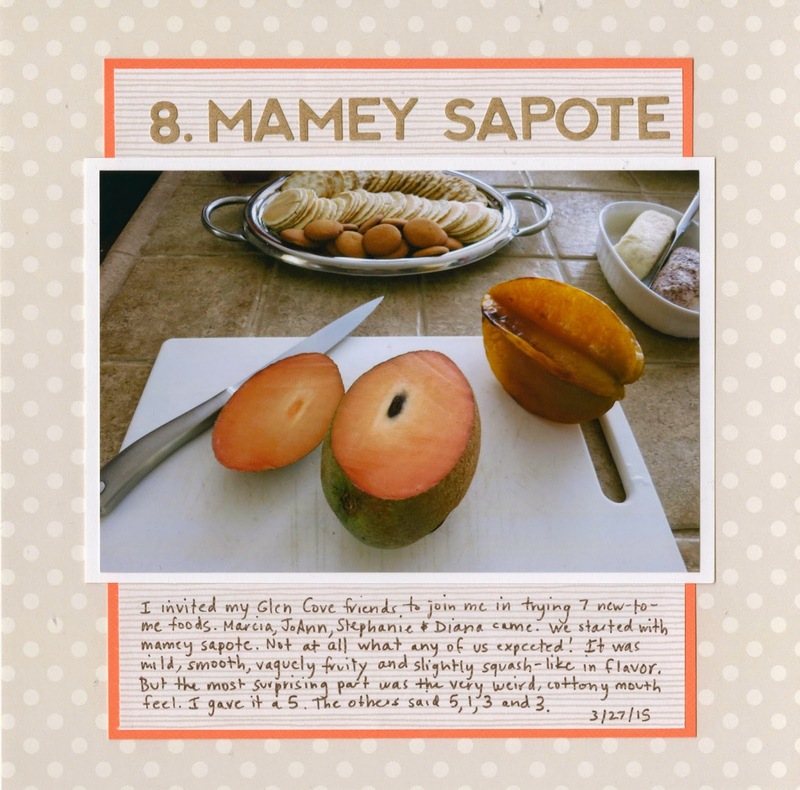 Unlike the papdi, there were no mystery seeds (fruit pods?) to mar the taste. Unfortunately, the taste was marred somewhat by the oil used to cook these. They were quite greasy and there was a not-quite-fresh taste to the oil. Too bad, as I think they would have been pretty good otherwise. I gave them a four. I LOVE National Scrapbook Day. I'm not exaggerating when I say it's my favorite day of the year. For years, I've always celebrated the same way: I get up before dawn, complete as many NSD online challenges as possible, chat with crafty friends around the world, visit blogs, watch scrapbook videos, enter every prize giveaway I can find, and collapse into bed after midnight. I love it. I'm not a fast scrapper 364 days of the year, yet on NSD I always manage to finish at least 10 layouts. The challenges push me out of my comfort zone and the time pressure helps me commit to decisions about design and product quickly. I'm really proud of the layouts I've made during past NSD events. I'm hosting my own NSD event, here at My Creative Life! All of you are welcome to join the fun. I will combine these items randomly to create 10 different challenges. Some challenges will have two components (for example: use chipboard and bling) while others will have three components (such as: use a stencil, 2+ hearts and stitching). I will post the challenges at 5:00 am PDT this Friday, May 1. Once the challenges are posted, start creating! This online crop is not just for scrapbookers. Card makers are welcome too. In fact, I'd love to see how one of you would incorporate 5+ photos on a card! I also encourage scrappers and card makers from anywhere in the world to join me here. Starting on Monday 5/4 and continuing for at total of 10 weekdays, I will share the layout I made for each challenge along with one or more of others' creations. 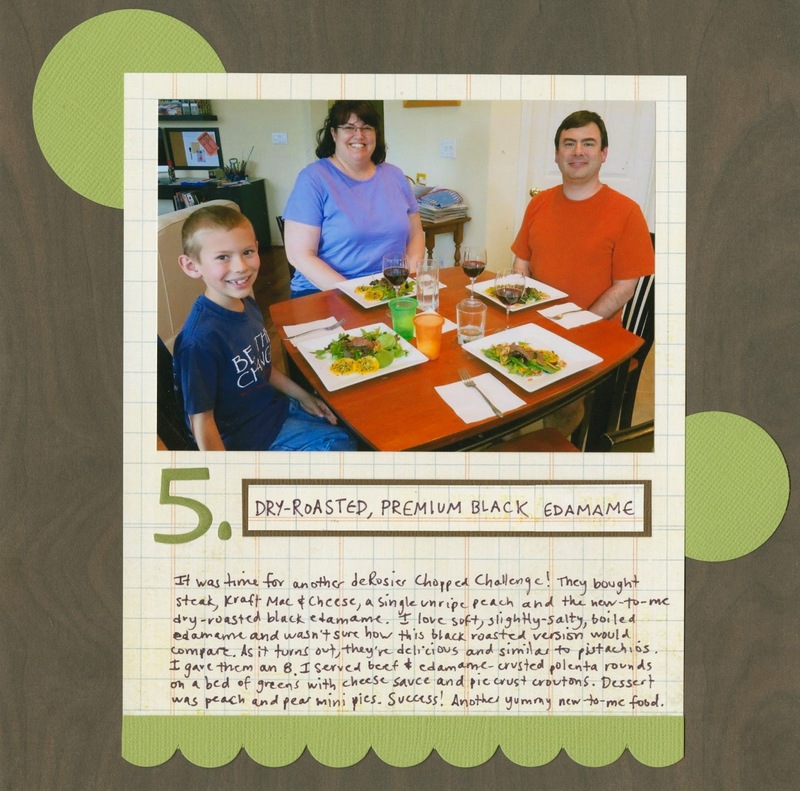 On Friday 5/15, I'll use Random.org to pick one participant to win a $20 gift certificate to Scrapbook.com. As I mentioned Tuesday, Steve's boss was in town last Thursday through Sunday. Andy is from England and this was his first visit to northern California. We wanted to take him to as many sites as possible and show him just how beautiful and diverse the San Francisco Bay Area is. We are blessed to live near so many amazing sites, areas people come to visit from all around the world: San Francisco, Napa Valley, the redwoods, Tahoe... the list goes on and on. Obviously, we couldn't take Andy to see everything in just 4 days, but we did hit quite a few highlights. We spent all of Sunday in San Francisco. Andy's one request was to ride a cable car, so that's how we started our day. We had to buy tickets and then wait through 5 cable cars before we could get on, so I suggested to Trevor that he and I pass the time by having an alphabetical photography contest. Steve offered to judge and clarified the rules. Trevor and I would each take pictures of anything we saw during our day in San Francisco. Once home, we would select up to 26 photos and caption them with "A is for ____" through "Z is for _______." For each letter of the alphabet, Trevor and I go head to head. Whoever had the better photo for that letter would win a point. It worked like a charm. Not only was Trevor occupied during long waits, he took a lot of pictures of things in San Francisco he wouldn't ordinarily have necessarily even noticed. By the end of the day, Trevor had taken photos for every letter except Q, X and Z. For some letters, like S (seagull, sea lion, sourdough, etc. ), he took dozens of pictures. Here are some of my favorites of Trevor's photos (in chronological order, not ABC order). They're straight out of the camera with no cropping or processing at all. We had such a fun day! As far as I'm concerned, we all won. Trevor has received the USA Edition of Little Passports for 1.5 years now (thanks, Aunt Teri!) which means that he's learned about 36 of the 50 states so far. 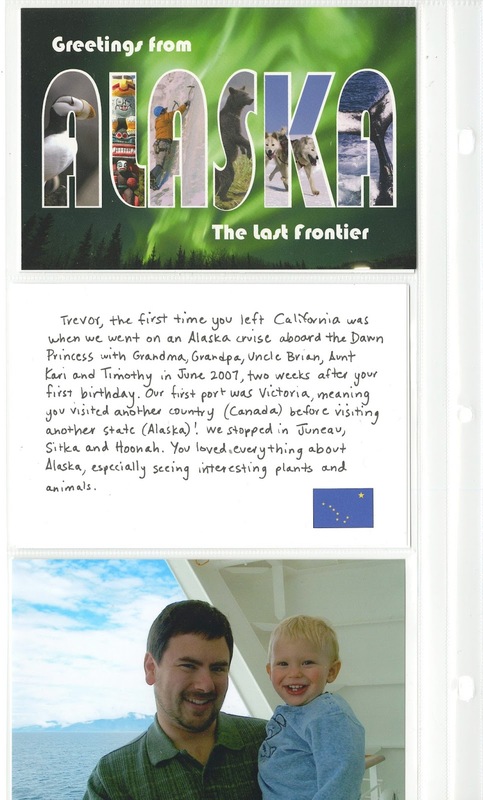 We've been working together to make an album with a page for each state that includes the Little Passports postcard, a photo of Trevor's first visit to that state, and a journaling about the visit. You can see the first completed pages (Washington and Hawaii) here and the next set of completed pages (Florida, Massachusetts, New York and New Jersey) here. 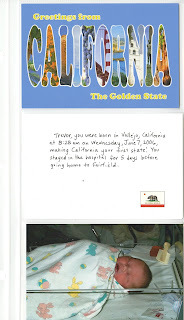 Trevor recently received the packet that included his home state of California. After some discussion, we agreed that the day he was born was the first time he visited California. So we selected the first-ever photo taken of him. As we agreed, I did the writing, as he was clearly too young to remember being born! Fortunately, I remember it well. Next, the completed page for Alaska. Trevor's first time out of California was on an Alaskan cruise when he was 12.5 months old. We sailed out of San Francisco. Our first port of call was Victoria, B.C., meaning that Trevor visited a foreign country (Canada) before visiting another state for the first time! I imagine that's fairly unusual. He absolutely loved Alaska. 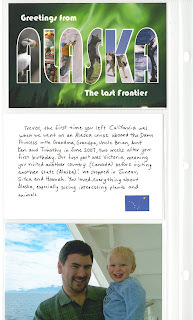 Even though he's been back to Alaska and has memories of the more recent trip, I did the journaling in the album with information about his first visit. We're anxiously awaiting the Little Passports packets for Maine, Nevada and Oregon. Trevor has already picked out the photos and done the journaling for those pages, so as soon as the postcards arrive, he'll slide those in to complete those pages. In my previous update, I mentioned that we're planning a summer visit to two new states. We have good friends in northern Colorado, so we'll be visiting them and doing a day trip (and possibly an overnight) to Wyoming. We're all really excited. Just this week, we made plans for a summer road trip to a third new-to-Trevor state, Idaho, where my brother-in-law will soon be working. We're looking forward to that trip too! If all goes as planned, Trevor will have visited 14 states by the end of the summer. So expect another 50 States Album update then! 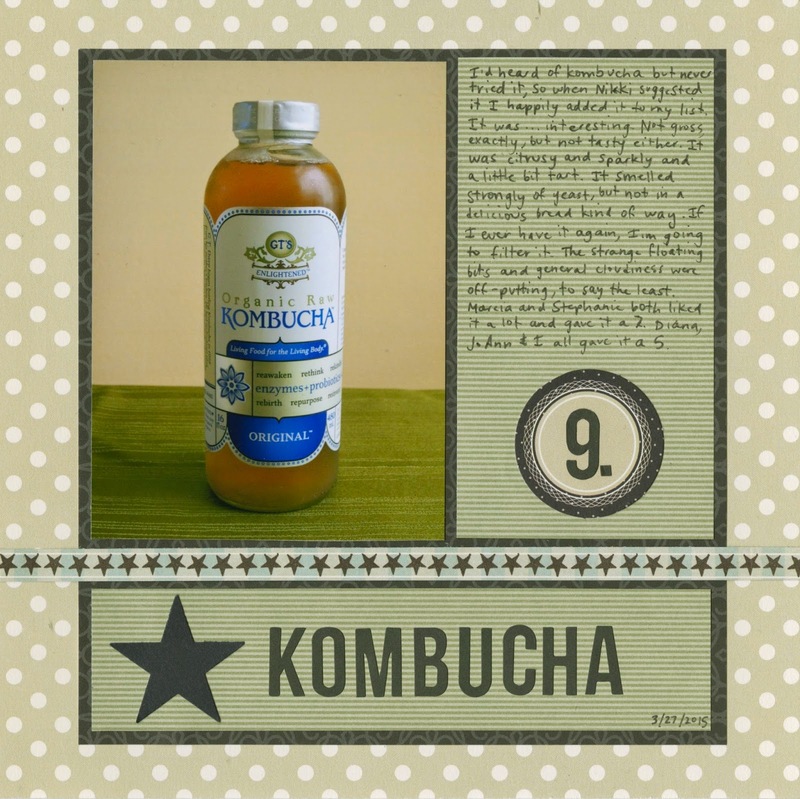 Item #9 for 43 New-to-Me (and the second item I tried with my teacher friends) was kombucha. If you are not familiar with kombucha, it is a slightly sweet, fermented, yeasty tea. If you have a hard time wrapping your head around that combination of ingredients, give it a try. It's unusual. I didn't hate it, but I didn't love it. I gave it a 5. I'd drink it again, but I wouldn't buy it. And next time I had it, I'd probably filter out the floating stuff that was somewhat off-putting. Have you had kombucha? What are your thoughts? We've been doing a lot of celebrating in the deRosier house recently! Steve hit the 2 year mark with his current job! This is huge after all the layoffs he's experienced over the years and the nature of his industry (embedded software engineering). He likes his job and it's going very well. And speaking of Steve's job, we had the pleasure of hosting his boss, Andy (who lives near London), during his first-ever trip to northern California this past week. We had great fun showing Andy around San Francisco, UC Davis (our alma mater and Trevor's future school, if our brainwashing continues to be as successful as it has been so far), and everywhere in between. Trevor hit the 2 million word mark in Accelerated Reader this week, another cause for celebration. Last year, he reached 2 million words right at the end of the school year. He'd been about 20,000 words short (one decent-sized chapter book) from finishing in time to have his name listed as 2 million on the t-shirt. That was his goal for 3rd grade. He's made the t-shirt list with about 5 weeks to spare, so it'll be fun to see his final word count for the year. I love that he's such an avid reader. I have my own occasion for celebrating, as my blog just turned four! I've been blogging 5 days a week, 51 weeks a year, for four years... and I still love it as much as ever. I continue to be amazed at the blessings blogging has brought to me. 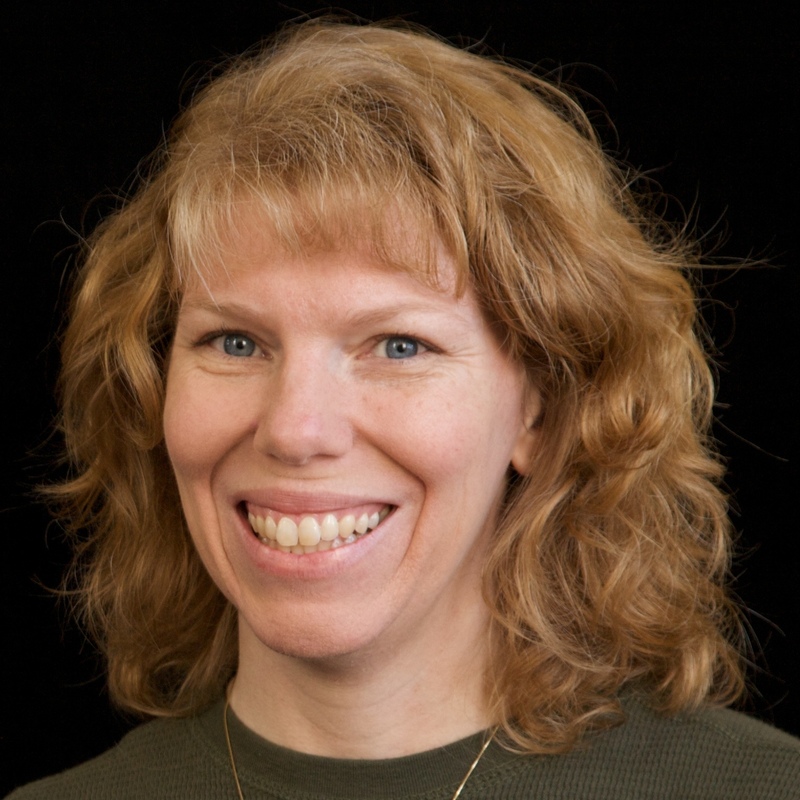 I've met wonderful people and had some amazing opportunities because of this blog. My blog has grown quite a bit from its humble beginnings in April 2011. My first blog post was titled Craft Withdrawal and fewer than 10 people read it. My most popular post, The World's Best Classroom Birthday Treat, has around 70,000 pageviews and gets hits every single day. To all my readers- thank you. I am so grateful for your support. For the handful of you who have read all 1088 posts, a special thank you! I'm really excited about what the future holds for me and My Creative Life. Trevor turns nine at the beginning of June, so we've started working on his party. He's known since about 10 minutes after last year's party ended that he wanted a "How to Train Your Dragon" theme for age 9. Location was a bit trickier. Trevor thought a lot about different locations. He ruled out having his party at home; he wanted to go somewhere. He considered the pros and cons of a free location (like a park) where he could invite pretty much everyone he knows, versus inviting fewer people to a place where we have to pay by the child. After great consideration, he decided that he wanted to have a skating party and invite just a few friends. He's done both roller skating and ice skating lessons recently, so he looked at both locations as possibilities before deciding that ice skating was the better choice. It's considerably closer to home, much less expensive, and available on his actual birthday. The skating rink offers three levels of party options and Trevor surprised me by insisting on the least expensive one. He was adamant that he didn't want a party hostess, a private party room, nor their included (and thus, not adequately themed) cupcakes. Fine by me. With the date, time, location and theme set, it was time to make a guest list and create our invitations. Trevor found a picture of Toothless that he liked and asked me to sketch it. When I was happy with my sketch and Trevor had approved it, I cut it and traced it onto black cardstock. Then I cut that. Trevor went through every single piece of green cardstock I own to find just the right shade for Toothless' eyes. I cut the eye shapes and glued them in place. Trevor was thrilled. We scanned the image on a white background. I didn't do a lot of woodworking as a kid, despite the fact that my dad is an expert. I made some small things with him over the years, but my sister is the one who created beautiful furniture and other major pieces. In addition to little things I made at home, I did one year of woodworking through 4-H (with classes taught by my friend Colleen's dad). One of the 4-H projects I was most proud of was my first (and, so far, only) jigsaw puzzle. I was 12 when I made it. I drew my design on a piece of wood, then used the jigsaw to cut it into four pieces. I glued the original piece of wood to a second piece of wood that was the same size, then sanded and painted the pieces of the goose, then treated the whole thing to a beautiful, glossy finish. I thought it was super cute and would do really well at the fair. I got high marks for quality of worksmanship, but was graded way, way down for the usability of the puzzle. I was confused at first. The puzzle pieces fit perfectly with no gaps! They stayed in place. What else do you expect from a puzzle?! Well, it turns out that puzzles with only four pieces are usually intended for young children. And those four pieces should not be small enough for a young child to swallow. Nor should they be sharp and pointy, like the tail and the neck pieces. Oops. Now that I'm a mom, it's obvious to me that this puzzle is completely inappropriate for a toddler. I found it recently when I was going through my childhood closet. After taking photos, I put it into the trash. Maybe someday I'll make a more child-friendly puzzle. Or perhaps I'll leave the woodworking to the experts. 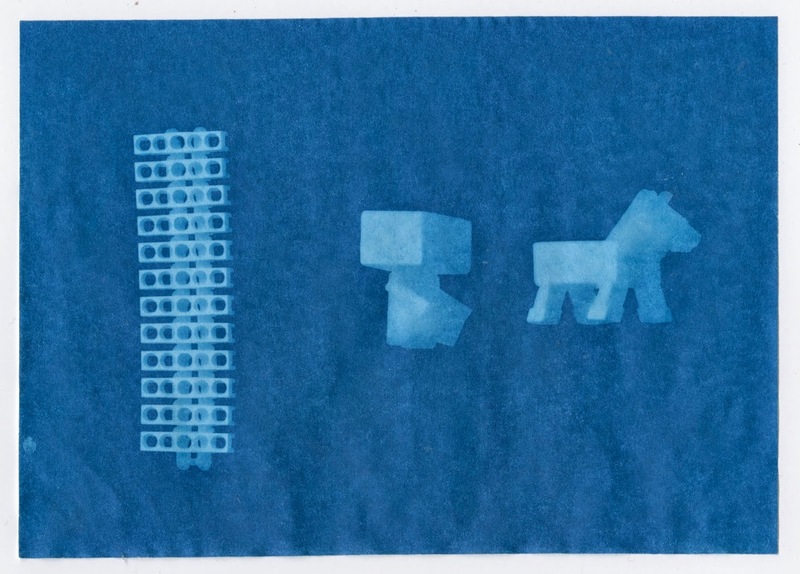 One of Trevor's Cub Scout electives this year was to make nature-inspired sun prints. Fun! We took the supplies into the backyard and started selecting promising leaves, flowers, and other elements for the prints. I showed Trevor how to do his composition in the shade and then move it to the sun for exposure. For his first design, he used two leaves and a flower. Trevor made a few more nature-inspired prints, then he headed indoors to look for other interesting things to try. Here is a Lego spike strip and two Minecraft characters. Here are three of his favorite minifigs, separated into all their parts. These dimensional items added interesting shadows to the sun prints that the flattened leaves and flowers did not. Of course, it is impossible for me to be around any type of crafting without joining in, so I made a few prints of my own. My favorite was a grouping of seven small flowers. 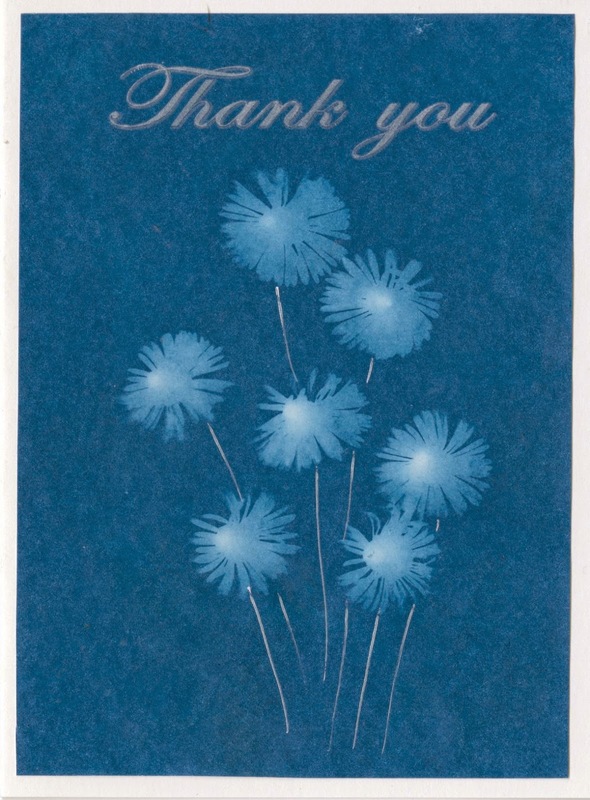 When the print was dry, I added a rub-on, drew stems with a white pen, and attached it to a card base. 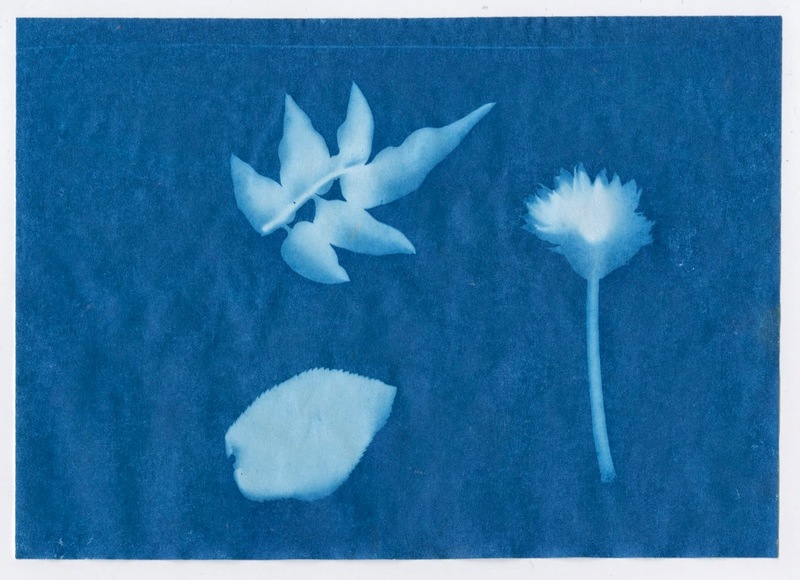 To make your own sun prints, you need a special paper (cyanotype). 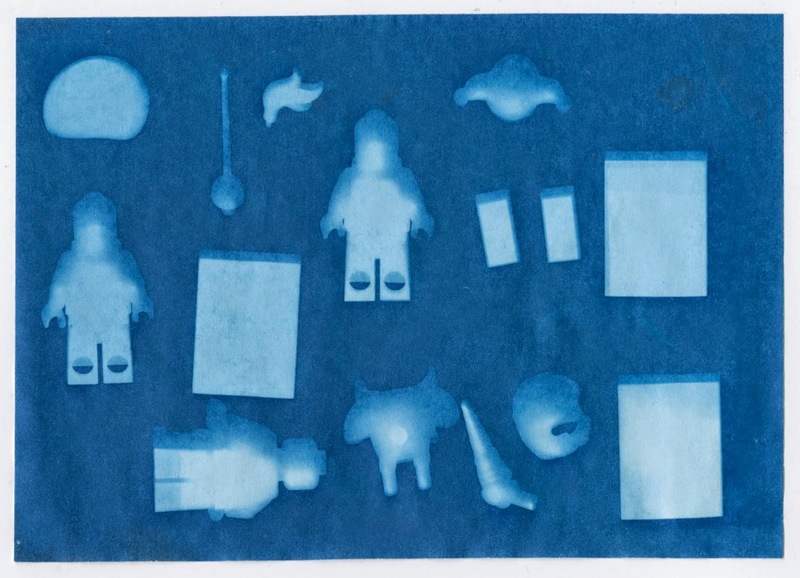 It's easy to find in craft stores or science museum gift shops packaged as a sunprint kit. It's around $10 for 15-20 papers. Here's an affiliate link to one (of many) brands sold through Amazon: Super Sunprint Kit. On the same day that I learned that I hate galangal, I tried my 7th new-to-me food. 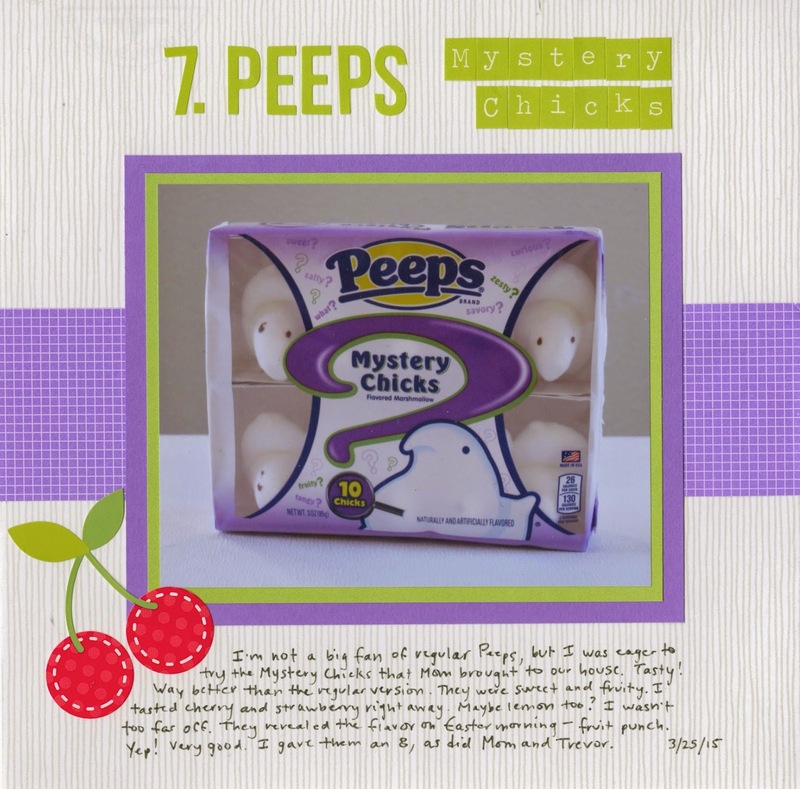 My mom had brought along Peeps Mystery Chicks. After we finished our stir fry that was gloriously galangal-free, we opened the Peeps. I'm not a huge fan of Peeps, but these were much better than the originals. They were sweet and fruity and delicious. I tasted cherry, strawberry and maybe some citrus. Trevor said strawberry for sure. Mom agreed that there was berry, but also tasted some pineapple. Strawberry lemonade? Cherry limeade? It definitely tasted like a blend. We all rated it an 8. We had to wait until Easter morning for Peeps to reveal the answer.... fruit punch! Yep. That's exactly how it tasted. I discovered my 6th new-to-me food at an amazing Asian grocery store nearby. I strolled amongst the produce hoping to find something I'd never tried. I found two items, including galangal, which looked a lot like ginger. When I got home, I looked up galangal and learned that, while it is nicknamed Thai ginger and it is related to ginger, it's harder than ginger and has a different taste. I've eaten a lot of Thai food over the years, in both restaurants and in Thai friends' homes, so chances are good that I've actually had galangal in things. But I certainly had never had it on its own, nor as the main component of a dish. I read that it is great in stir fry and can even be sliced into matchsticks and added raw to salads. My mom was in town visiting while Steve was on a business trip, so I decided I'd make a simple stir fry for dinner using the galangal. I never got that far. Mom and I each tasted a tiny sliver of it raw before I added it to the pan. Oh. My. Gosh. The best way to describe it is: nothing, nothing, nothing, FIRE! And not good-tasting fire. Trevor had the same reaction. I had a lot of fun making this layout. I knew I wanted to use the color red (as in, STOP!) and toyed with the idea of using a no symbol somewhere on the page. Then I noticed a pack of love-themed die-cuts. I dug out a heart with plans to add a no symbol over it, but then I discovered the "do you like me?" 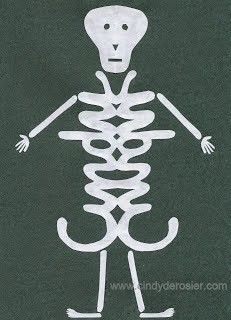 die-cut piece. Perfect. 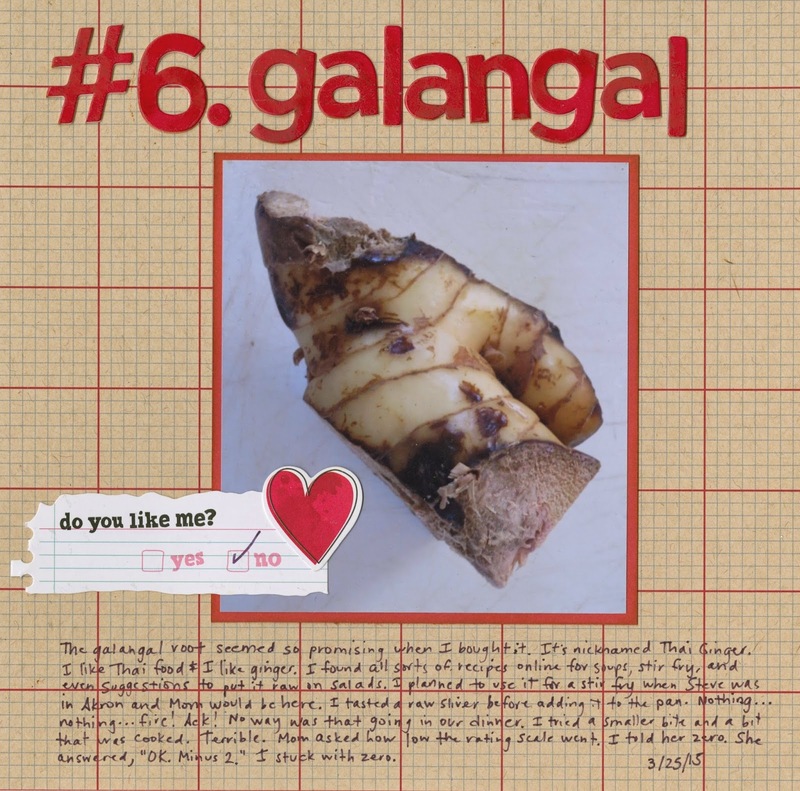 Sorry galangal. I do not like you at all. My mom asked what the bottom of my rating scale was. I told her that it was 0-10. Her answer? "OK, on a scale of 0-10, I give it a -2." Trevor and I both opted for the 0. My fifth New-to-Me food for my birthday challenge was dry-roasted black edamame. We love the warm, green, slightly-salty, boiled edamame that are (is? *) frequently served in Japanese restaurants. In fact, we love them (it? *) so much that we planted soybeans last summer and made edamame at home. I like a wide variety of soy products, so I expected to like this dry-roasted black version. It was actually one of the 4 items Steve and Trevor put in my latest Chopped basket. I liked the edamame out of the bag and incorporated into my dish. I rated them (it? *) an 8. *Different websites vary on whether to treat edamame as a plural (edamame are) or collective (edamame is) noun. I found countless pages of discussion (quite interesting to a grammar nerd like me!) but nothing definitive. What's your opinion? 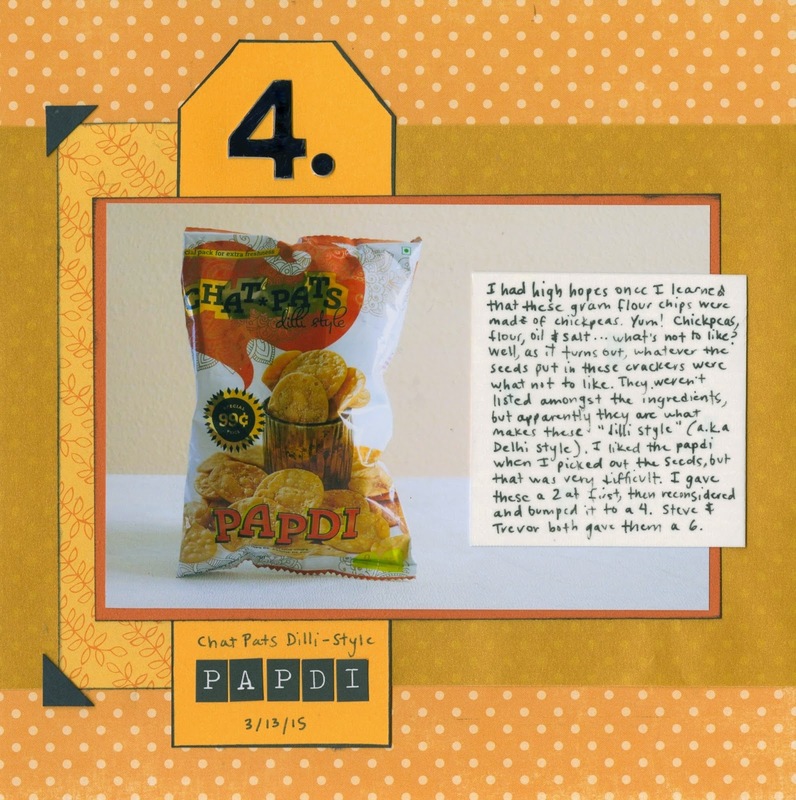 Time to share #4 from my 43 New-to-Me birthday challenge, Chat Pats Dilli-Style Papdi. I found it at an Indian grocery in town. The ingredients listed gram flour, flour, oil and salt. I didn't know what gram flour was, but I was intrigued, so I bought the package. When I got home, I looked up gram flour and learned that it is made from chickpeas. Yum! Chickpeas (aka garbanzos), flour, oil and salt sounds pretty good! I was really looking forward to these crackers. Alas, I did not like them. There were seeds throughout the crackers that I didn't like at all. They weren't listed amongst the ingredients, which is really irritating. It doesn't seem right to list only four ingredients when there clearly is at least one more major ingredient. Determined to identify the seeds, I used a knife to carefully scrape some out of the crackers in hopes of identifying them. Then I talked to an Indian friend of mine, Hemina, for help. She told me that "dilli-style" refers to the spices of the Delhi region. Unfortunately, that is not her region and thus not very familiar to her. After a bit of research, I've decided that the seeds were most likely ajwain (technically fruit pods, not seeds) or possibly cumin. When I ate the mutilated cracker crumbs that didn't have any seeds (fruit pods?) in them, I really liked the chips. So thumbs up to gram flour, but thumbs down to the mystery seeds (fruit pods?). I rated them a 2 at first, but then reconsidered and bumped them up to a 4. I didn't hate them nearly enough to justify the 2, but I don't plan to buy them again (unless it's solely to unravel the mystery of the seeds (fruit pods?) that aren't listed in the ingredients. Years ago, we were visiting relatives for Christmas and my Aunt Vickie introduced us to Omelets in a Bag. It was the perfect breakfast for a crowd- quick, easy, delicious, and with virtually no cleanup. Since then, we've made Omelets in a Bag for large family gatherings or for camping trips. We also have made them as a way to use up leftovers and not generate dishes on the final day of a trip to the cabin. To make Omelets in a Bag, you need eggs (rice-dyeing optional), quart-size ziplock bags, a Sharpie, a pot of boiling water, and any omelet toppings you like, such as cheese, bacon, ham, chicken, broccoli, avocado, mushrooms, tomatoes, onions, olives, etc. Have each person write their name on a bag. Crack the desired number of eggs into the bag (2 works beautifully), then add whatever toppings you like into the bag. Seal the bag, making sure to remove as much air as possible. Massage the ingredients together until everything is thoroughly combined with no visible streaks of white or yolk. Then drop the bags into simmering water. Try not to crowd them too much. There are six bags in this pot and that's definitely the maximum for this size of pot. Let the bags cook for 11-12 minutes, then check on them. The omelets should be soft, yet firm, with no traces of goo. Allow a few extra minutes for a 3-egg omelet. Then simply open the bag and roll the perfectly-cylindrical omelet onto a plate. Or, eat them directly out of the bag for even less cleanup. Delicious! I'm sure some of you are concerned about heating food in plastic bags. If that worries you, then do not make these. I don't worry about the effects of having these once or twice a year. Edited to add: A friend asked me if I had an "after" photo of the omelets. I didn't take one on this trip (too eager to eat my own warm, delicious omelet to stop and take a photo), but I did find one from a previous camping trip. This is a 3-egg omelet and apparently we used gallon-sized bags instead of quart. With the quart-sized bags, you tend to get a more perfect cylinder without the ragged edge that this one has. Even if it isn't as pretty, it's still mighty tasty! We just returned from our annual spring break snow trip to Bear Valley (at approximately 7000'), where Steve's parents own a cabin. We're never quite sure what to expect when we schedule the trip. It's pretty much a given that there will be 10+ feet of snow in the subdivision and the roads will be closed. This means we park at the lodge, use sleds to drag our luggage up the hill to the cabin, and dig our way in. In 2011, we had to dig DOWN to get to the front door on the second story. This year, the roads were not closed and there was no digging. In fact, other than a tiny patch of snow on the shady side of the cabin, there was no snow at all. No matter where you are, you've probably heard that California is in a drought and that the snowpack is dangerously low this year. In fact, it's a record-breaking year... and not in a good way. This is around 7200'. No snow there, nor on the mountains in the background. The ski resort at Bear Valley (8000+ feet) makes snow, yet this is what it looked like when we were there last weekend. It's unbelievable. It usually looks like this in late May... or even June or July. Fortunately, they were still operating, so Trevor and his friend Ronan did get at least a little bit of snow time one morning. The place was practically deserted, so it wasn't too difficult to ski around the large dirt patches. We left around 1:00. What little snow was left was getting slushy. Usually when we go to the cabin in the spring, the boys build snow forts, go sledding, and pretty much spend all day every day outside in the snow. They amused themselves (and us) by trying all the snow activities they'd usually do in the small patch of snow behind the cabin. Their attempts at sledding were hilarious. One nice thing about the lack of snow (other than being able to drive up to the cabin and not having to dig our way in) was that we could do some geocaching. (Needless to say, we don't geocache when caches are covered in 10-20 feet of snow.) This little fellow with a brown bushy tail nervously watched us search for a nearby cache. I think he's a marten. We also did lots of Easter activities. Jonna had sent me the link to a video (no longer online), suggesting that we might try it at the cabin. I was skeptical as to whether it would work or not, but agreed to try it, knowing that an utter failure could make just as good a blog post as a success would. I played the video for the assembled group, then asked them whether or not they thought it would work the way it did in the video. Jonna was optimistic, while Ronan and Trevor were both doubting a bit. Nobody was sure it WOULDN'T work, but no one else was as confident as Jonna. While Jonna got out the rice she'd brought, I pulled out food coloring and the eggs I'd brought for our Easter morning omelets. Immediately there was concern. The eggs weren't hard-boiled. I dye raw eggs all the time without issue, so I'd never even thought that I should hard-boil them for this application. Would raw eggs withstand the shaking as well as cooked? We'll see! Issue #2 arose when we realized we didn't have lidded cups. We decided to use cling wrap instead of a lid and hope for the best. Ronan and Trevor each put rice into a cup, then added food color. They put the cling wrap tightly over the cups and shook to distribute the dye throughout the rice. Then they gently peeled back the cling wrap and placed an egg in the cup. They shook it, gently at first, then more vigorously as they realized the shells weren't going to crack. They fished out the first eggs... success! They were gorgeous and perfectly mottled. They tried other colors and combinations of color. Success all around. Rice dyeing for the win! We let the eggs sit until the dye dried, then brushed off the extra rice bits. They were so pretty! We made all of these shades with just the four little bottles of food color (red, yellow, blue and green). Tomorrow I'll share the egg 'recipe' I used for Easter breakfast.